Our favorite side dish. 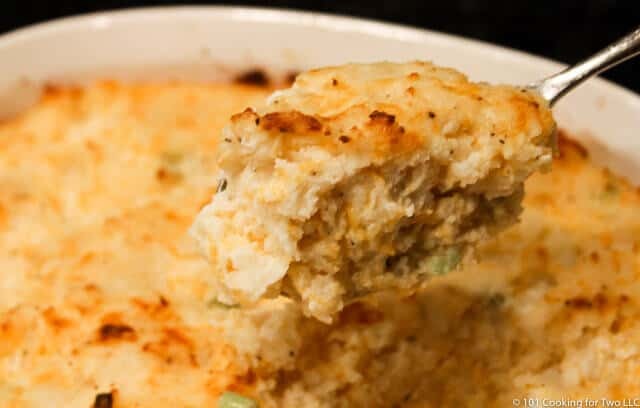 No special family meal is complete without this delicious old-fashioned cheese potato casserole. Just follow these easy step by step photo instructions. Editor’s Note: Originally published October 5, 2013. This post has been expanded with more information for you, and the photos are updated. This recipe was in my top 10 recipes of 2013. I have repeated this dish hundreds of times. Please enjoy one of our favorite dishes. This is another old family recipe that was to be one of the first posted on the blog, but somehow it just didn’t make it early on. Ultra tasty, everyday simple but company good. A great side dish for BBQ, ham or almost anything else. 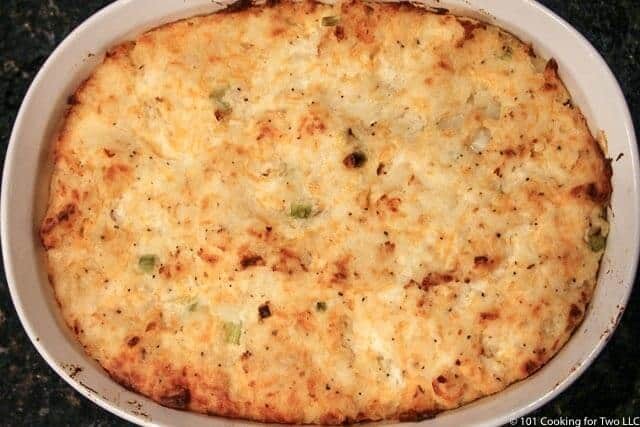 Cheesy potato casserole has been a standard on holiday table for 35 plus years and is a recipe everyone must have. It is that good. My wife has declared this as part of her absolute favorite meal. Combined with my Easiest Oven Baked Kansas City BBQ Beef Brisket and you have her in heaven. 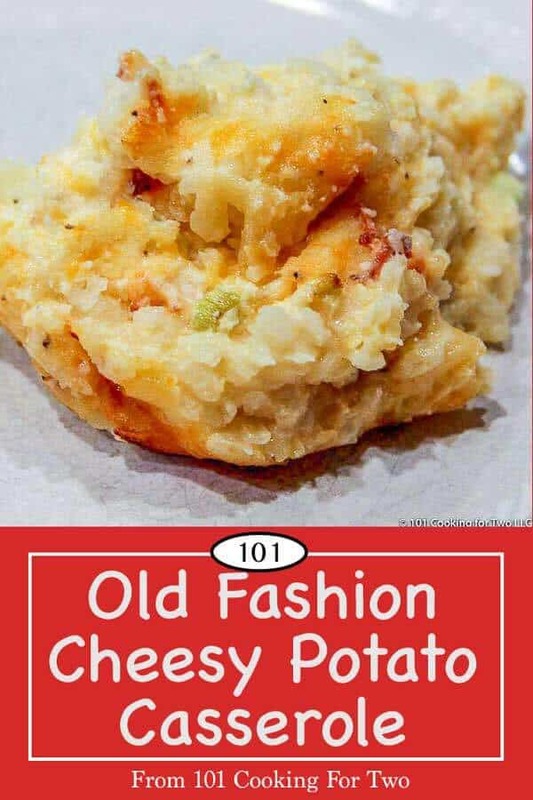 This is similar to recipes called Funeral Potatoes or Crack Potatoes. Think of this as the original version. Almost all the newer versions use frozen potatoes. Please, please, please don’t do that. Cooking your potatoes will take this recipe from good to fight over the leftovers great. Boil some potatoes. Shred. 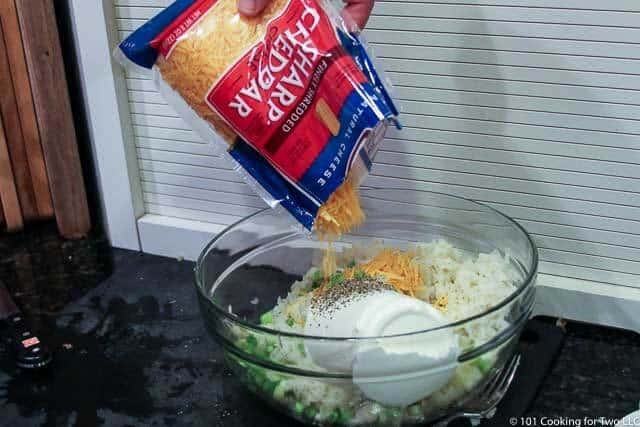 Mix with sour cream, cheddar cheese, chopped green onion, salt, and pepper. Bake. Sometimes the simple ones are the best. I really don’t like frozen potatoes of any type here. There are definite taste and texture issues. It is ok with frozen, but it is fantastic with cooking your own potatoes. We usually use Russet potatoes, but any potato type will do. You can try to make it a bit healthier by using lower fat ingredients. There is little change with the lower fat sour cream, but low-fat cheese just does not cut it here. To make it more of a crack or rebaked potato casserole, add bacon. 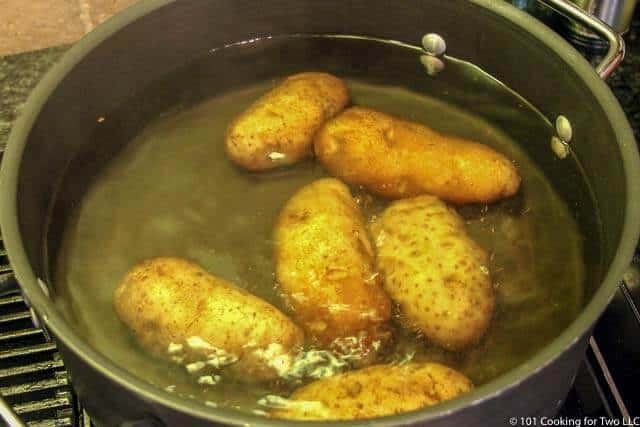 In a large pot, add enough water to cover the potatoes and bring to boil over high heat. 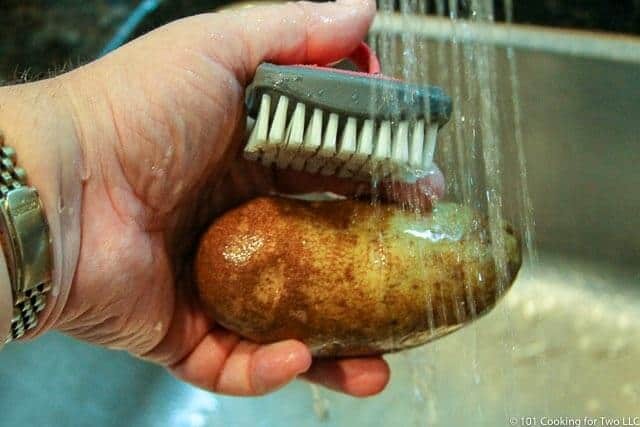 Scrub 6 medium potatoes. I always use Russet, but others should do. Poke each potato a few times with a fork. This will help them not “explode” in the pot. They may still split some but not as bad. Add potatoes to the boiling water. Turn the heat down to low so you don’t boil all the water off and cover. Cook until fork tender. That is when you can stick them with a large fork, and it will go all the way through. About 40 minutes. Time may vary some due to the potatoes. Remove from the water and place in refrigerator to cool for a couple of hours. Peel the potatoes. After they have cooled, the skin comes off easily with scrapping. Shred the potatoes. Here I’m hand shredding, but a food processor would be fine. I’m too lazy to get it out and clean it. Clean and slice six green onions. To the potatoes add 2 cups sour cream, 2 cups sharp cheddar cheese shredded, one teaspoon salt, 1/2 teaspoon pepper and the green onions. Mix well. Spray a larger baking pan with PAM and add the mixture. Smooth top. At this point, you can cook or cover and refrigerate for a day before cooking. Preheat oven to 350 convection (375 conventional). Bake until golden brown. 35-40 minutes. A little more if cold from the refrigerator or a little less if a half recipe or a thinner pan. Our favorite side dish. 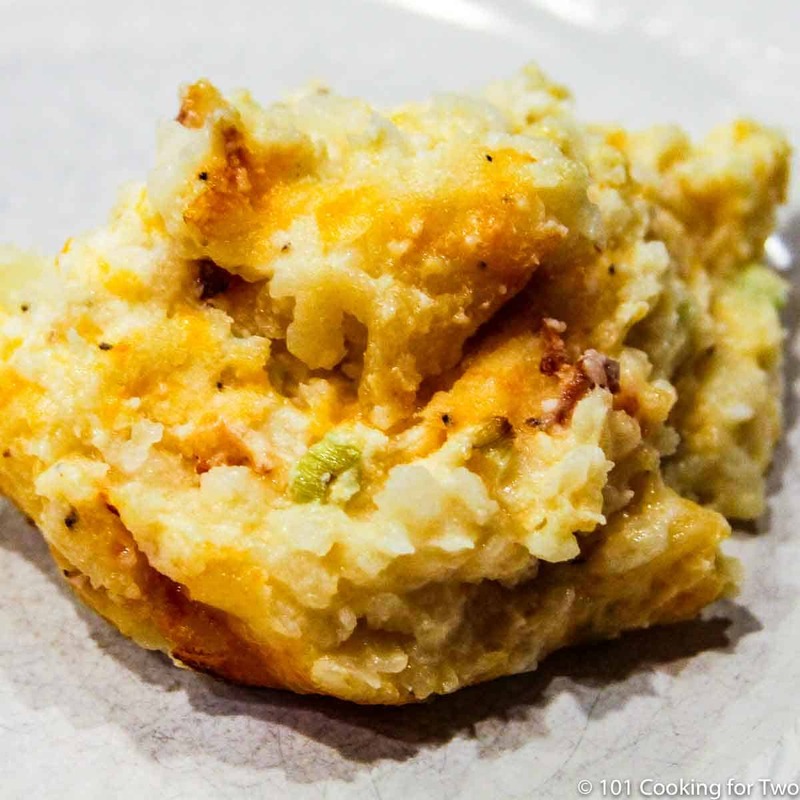 No special family meal is complete without this delicious old fashion cheese potato casserole. Just follow these easy step by step photo instructions. Add potatoes to the boiling water. Turn the heat down to low-medium so you don’t boil all the water off and cover. Cook until fork tender. That is when you can stick them with a large fork, and it will go all the way through. About 40 minutes. Time may vary some due to the potatoes. Remove from the water and place in refrigerator to cool for a couple of hours. Peel the potatoes. After they have cooled, the skin comes off easily with scrapping. Shred the potatoes. Clean and slice six green onions. 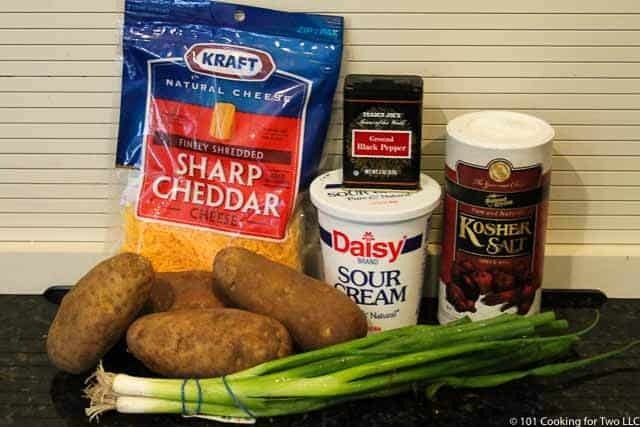 To the potatoes add 2 cups sour cream, 2 cups sharp cheddar cheese shredded, one teaspoon salt, 1/2 teaspoon pepper, and the green onions. Use the type of fresh potatoes you want. Please do not use frozen hashbrowns. That will take the taste and texture down a couple of points. Suggestions for variations in the discussion. Make ahead and refrigerated for up to 3 days covered. We love this recipe. I wanted to make this quick one night so I used hashbrown potatoes that you have to hydrate. Followed the rest of the recipe exactly and it came out petfectly. My husband who does not normally eat a lot of potatoes had three helpings. He’s excited that I’m making them tonight. This is my wife’s must have side dish for any special meal. This has been on our holiday meal menu for many years my Mom made it now I make it for my family. One thing that we do is use block cheese cracker barrel tastes the best we melt the cheese with a stick of butter until creamy. Take off the heat and mix with the sour cream. Yummy. I can’t wait to try this recipe. 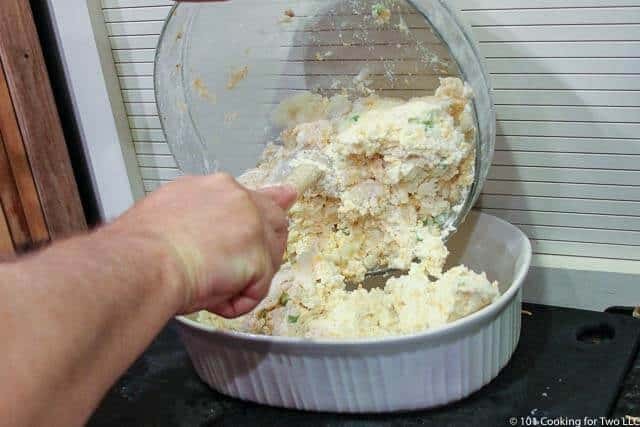 I find your recipes are straight-forward, simple and always giving great tips. I am not a very good cook, and forever looking for help. Thanks, DrDan. I did the oven baked drummies tonight and they were so good. Couldn’t find a link for a reply, so I am replying along in this message. Dr Dan, yummmmmm. These are a better version of a cheesy potato recipe my family has made for years, that we always called party potatoes. I can’t to try your version. No time tonight to do it but it looks good. I’ll save it to do with chicken. I’m doing this for the weekend with our ham. We almost always do this with ham. I have a small smoked ham on the dinner menu and this would pair perfectly. Can’t wait to give this a try! 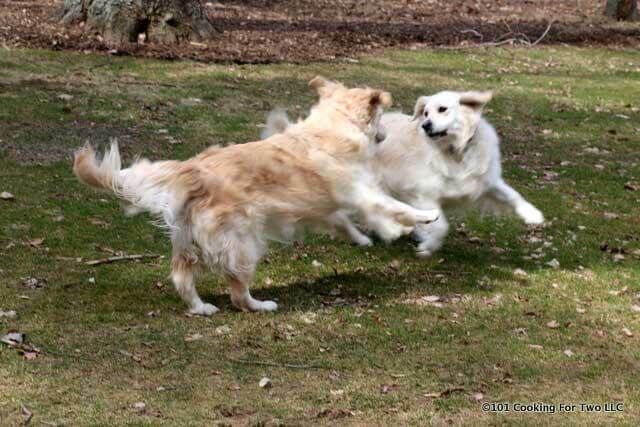 We are planning this for Easter Sunday with our ham. I loved this casserole! The taste is wonderful, but my favorite thing is the flexibility. I have physical issues so being able to wait a day to bake is awesome. 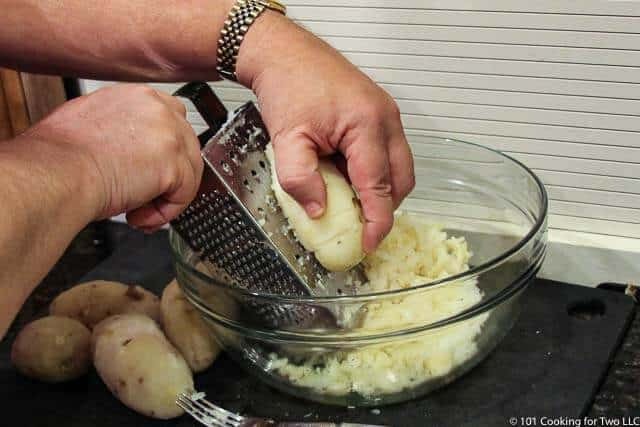 This recipe is actually almost identical to one I grew up on, but my mom’s doesn’t have the step which chills the potatoes. It makes a big difference since potatoes shred neatly. Hers tastes wonderful, but the texture is more chunky. I like this one better. My oh my. I’m headed to the store! Thank for the note and rating. This is just so good. We run our potatoes thru a ricer. Would this be an ok texture for this dish? Or would shredded work better? Thanks! Goodness!! Can’t stop looking at this dish!! I’m going to try something risky with this one. I don’t have two cups of sour cream but I do have 2 cups of sour cream based chipotle cream sauce leftover from our fajitas. I think that will taste good used in this recipe but might be too strong.